I try not to be so strident about what “you need to do,” but I’m breaking this rule for a particular Alto Adige wine that I adore. I mean, just look up at this amazing photo! Alto Adige is a picturesque, dramatic region of Northern Italy, right below Austria. The wines, especially the white wines, have a special place in my heart. Why? They seem to have a purity that I have found in the wines of few other places. What does it mean to call a wine “pure”? It’s a bit nebulous, I must admit. But when I think of the purity of the wines of the region, I think of pure as in “pure as a mountain stream.” They have an unadorned quality to them and seem to be the embodiment of refreshment in liquid form. 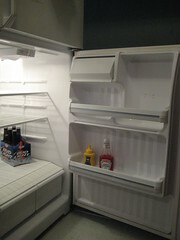 So if your fridge looks a little sad and lonely, all you need to do is add a great Alto Adige wine to brighten it up. 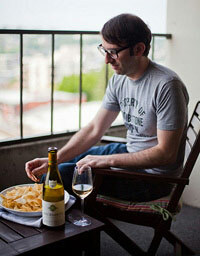 And though I have a particular fondness for the Kerner, all of their white wines are great. I especially want to highlight the excellence of their Pinot Grigio. If your experience with Pinot Grigio has been underwhelming, filled with nondescript, inoffensive, boring yet certainly drinkable bottles, the Abbazia di Novacella is the cure. Top photo courtesy netplanatir. Bachelor fridge (certainly not my fridge, which is full of organic, local, sustainable produce) courtesy J$. Sounds great! 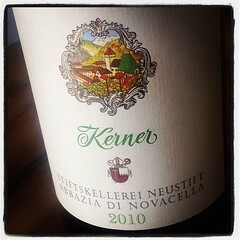 I’ve enjoyed some good wines from the region but don’t think I’ve had kerner. I highly recommend it. And I’m looking forward to your post about Whidbey Island Winery.